The Advanti Racing Torcere silver wheel is available in 19x8.5, 19x9.5, 20x9 and 20x10 sizes. Free shipping on all Advanti wheels. Free lug kit with the purchase of 4 Advanti Torcere silver wheels. 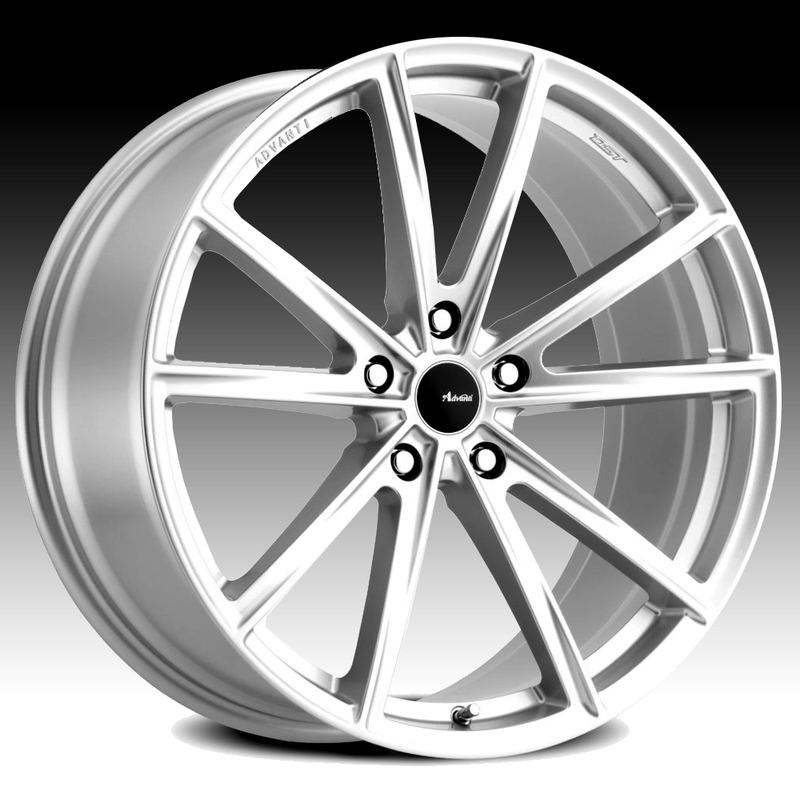 19x8.5 5x112 +45 TO9851245FS $249.00 29 Lbs -->> Call or email for special deals! 19x8.5 5x114.3 +45 TO9851445FS $249.00 29 Lbs -->> Call or email for special deals! 19x8.5 5x120 +45 TO9852045FS $249.00 29 Lbs -->> Call or email for special deals! 19x9.5 5x112 +45 TO9951245FS $259.20 29 Lbs -->> Call or email for special deals! 19x9.5 5x114.3 +45 TO9951445FS $259.20 31 Lbs -->> Call or email for special deals! 19x9.5 5x120 +45 TO9952045FS $259.20 31 Lbs -->> Call or email for special deals! 20x9 5x108 +40 TO0950840FS $306.60 32 Lbs -->> Call or email for special deals! 20x9 5x112 +30 TO0951230FS $306.60 32 Lbs -->> Call or email for special deals! 20x9 5x112 +40 TO0951240FS $306.60 32 Lbs -->> Call or email for special deals! 20x9 5x114.3 +30 TO0951430FS $306.60 32 Lbs -->> Call or email for special deals! 20x9 5x114.3 +40 TO0951440FS $306.60 32 Lbs -->> Call or email for special deals! 20x9 5x120 +30 TO0952030FS $306.60 32 Lbs -->> Call or email for special deals! 20x9 5x120 +40 TO0952040FS $306.60 32 Lbs -->> Call or email for special deals! 20x10 5x108 +42 TO0150842FS $316.80 34 Lbs -->> Call or email for special deals! 20x10 5x114.3 +35 TO0151435FS $316.80 34 Lbs -->> Call or email for special deals! 20x10 5x114.3 +42 TO0151442FS $316.80 34 Lbs -->> Call or email for special deals! 20x10 5x120 +35 TO0152035FS $316.80 34 Lbs -->> Call or email for special deals! 20x10 5x120 +42 TO0152042FS $316.80 34 Lbs -->> Call or email for special deals!